I have a complicated relationship with milk. 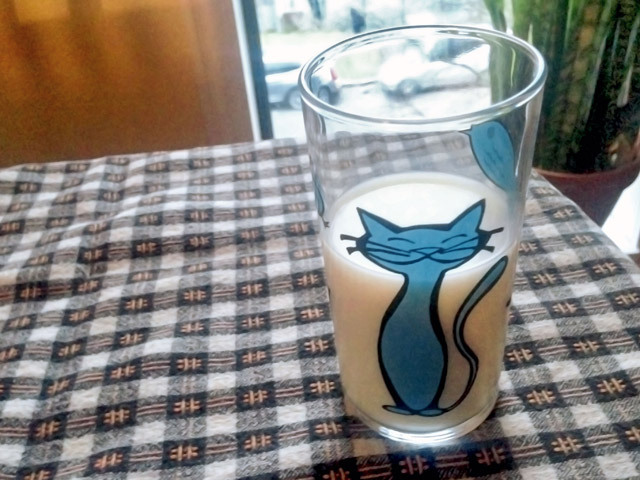 As a child, I hated dairy milk and, when presented with a glass of it, I would dutifully drink it all in as few gulps as possible because it was “good for me” and I was a child who cleaned their plate. When I ate cereal, I’d pour just enough milk into the bowl to keep the cereal from being dry – none of that sweetened leftover cereal milk for me to drink, no sir! In addition to disliking dairy milk, I loved spinach, cabbage, and brussels sprouts, so I like to tell people that I was born to be vegan. The first time I tried soy milk was in my teens. This was the 80s, so the soy milk was very different from the non-dairy milks we have today (and our choices were limited to rice or soy) and the milk curdled in coffee, and we still drank that coffee. Just kidding – that was when I learned to drink my coffee black. But I did discover that, where I couldn’t stomach the idea of cow milk, I did quite like the non-dairy counterpart. I was even able to (sometimes) drink a glass of it on its own! Today, the non-dairy milk aisle is an embarrassment of riches. Even in small town grocery stores, you’re likely to find soy, almond, coconut, and rice milk – all of which taste delicious, and stay intact in hot liquid! Some stores even have quinoa, hemp, cashew, and oat milks available. And vegetable milk. 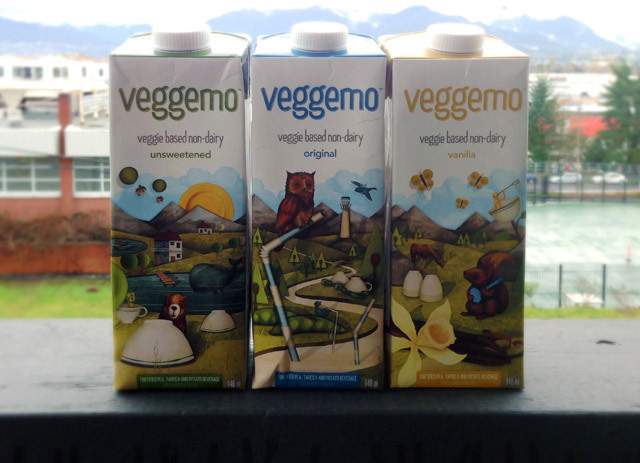 Given my complicated relationship with milk as a child, I was really excited when I was asked if I’d be interested in reviewing Veggemo, a new “veggie based non-dairy” milk. I figured, if I could give the milk a thumbs up, I’d be more than happy to recommend it to others. First, let’s talk about ingredients. When you look at the label, you’ll see familiar items that are listed on most non-dairy milks – things like gellan gum and xanthan gum (these things help thicken the milk and keep it from separating) and added nutrients like Vitamin D2, Vitamin B12, folic acid, etc. But what makes this milk milky is what the company calls a “proprietary vegetable blend”, made from pea protein, tapioca and potato starch and vegan enzymes. For 1 cup of Veggemo, the protein count is about half that of soy milk, at 4g, but is four times that of one of the more popular almond milk brands, which is only 1g. And fortification means that the vitamin and mineral content (the one shown in the bottom half of the Nutrition Facts label) is very similar to both almond and soy milks. Veggemo is listed as being free from lactose, gluten, soy, GMOs, and cholesterol, and is also vegan and kosher. Okay, so maybe you’re not a nutrition nerd or just are just looking for a delicious non-dairy milk, fine. I just needed to get that part out of the way. So, how does Veggemo taste? Honestly, I was pleasantly surprised. I was sent three flavours – Vanilla, Unsweetened, and Original, and I started with Vanilla. On its own, the texture was smooth, the flavour was definitely vanilla (perhaps trying-a-bit-too-hard vanilla), and it was a little on the sweet side. I immediately prepared myself a cup of earl grey tea and poured the milk in. No separation! It tasted smooth, a bit thin, and the sweetness definitely worked. Original and Unsweetened went through the same tests – first, a small glass, then in a cup of hot tea. All stood up well, and all had a tasty nutty flavour and had no aftertaste that many non-dairy milks have. I even used the Unsweetened flavour in my favourite batch of peanut butter cookies and the soft, almost neutral flavour of the milk didn’t change the flavour of the cookies at all and helped create the soft texture I was hoping for. Overall, my favourite out of the three flavours is Unsweetened. I like that it’s versatile enough to drink in a smoothie or a cup of tea without imparting any sweetness or too much flavour, and can also be used in a spot of mashed potatoes or in my beloved peanut butter cookie recipe. I would even go so far as to have a small glass alongside said peanut butter cookies. To find out more about Veggemo, please visit their website. When Michelle isn’t testing products, she can be found taking pictures of her cat, designing beautiful things (such as The Book of T.O.F.U. ), and slowly becoming an avid BC hiker. You can find her on Instagram at @foodncatz.